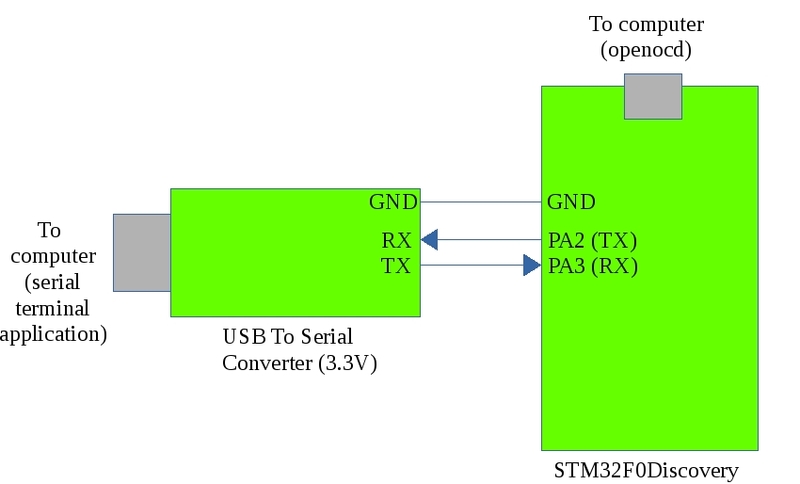 This example demonstrates the use of the UART with the STM32F0Discovery board. The example outputs a startup messages and echos back any line of text you enter. The example uses interrupt driven serial input/output. As you can see you need to use a USB to 3.3V serial converter which relays communications between a terminal application on your PC and the ‘Discovery board. These can be bought for as little as €3 online if you shop around. I use one from dx.com but you will find them on lots of other sites. The UART is initialized to run at 9600bps. Following this an endless while loop is entered which calls on two communications functions: eputs and egets. These functions behave just like puts and gets in a text based PC application. The function eputs outputs a given string to the UART while egets reads a string up to a maximum size from the terminal. Input is completed when the user presses Enter. initUART -> Configure I/O pins and the USART hardware to run at the specified baud rate. Transmit and receive circular buffers are initialized. usart_tx -> This function handles a transmit interrupt. If sends the next byte in the transmit circular buffer. If there are no bytes left to send it disables the transmitter. usart_tx -> This function handles a receive interrupt. It places the received byte into the receive circular buffer. If the buffer is full it sets a global error flag.